The USTA announced today that the SmashZone Mobile Tour, the premiere fan interactive attraction, will be part of the Jackson Heights Play Street at Travers Park in Jackson Heights (34th Ave. and 78th Street) on Aug. 11 from noon to 6 p.m. SmashZone Mobile Tour engages audiences by introducing them to the game in a fun and interactive way by makings stops at fairs, festivals, and air shows. Children will have the opportunity to play tennis games and it will allow participants to get a racquet in their hand from the start. For the last four years, the Green Alliance has helped operate a summer Play Street to close 78th Street to traffic in the summer months. In 2012, the first ever all-volunteer neighborhood group was granted approval to operate a permanent Public Plaza by the New York City Dept. of Transportation. The Public Plaza will keep 78th Street closed to traffic year-round, providing space for recreation, concerts, the Greenmarket and other activities, including Saturday’s SmashZone festivities. The 78th Street Play Street provides a safe place for the diverse population of Jackson Heights to interact and to play sports, and to generally be active and social. SmashZone Mobile includes a 53-foot trailer, which anchors four kid-sized tennis courts for youth play. Courts which will feature games such as Xerox Rally Courts, Esurance Sweet Spot and a Target Challenge. The trailer itself, which is handicap accessible, will feature interactive activities for visitors that will include video game kiosks featuring Mario Tennis Open for the Nintendo 3DS, a TENNIS Magazine Green Screen Cover Shoot, and Touch Screen Kiosks. SmashZone Mobile is a complement to the USTA’s ongoing youth participation initiative, 10 and Under Tennis. 10 and Under Tennis is part of an effort to encourage young people across the country to get moving and start playing tennis. The 10 and Under Tennis initiative is geared towards getting more kids to participate in tennis using modified equipment and courts tailored to a child’s size. By featuring shorter and lighter racquets, slower-bouncing balls, smaller courts and simplified scoring, children learn to play more quickly and easily while having more fun in the process. "We are thrilled to have the SmashZone Mobile Tour provide an opportunity for thousands of children to experience tennis for the first time," said Kurt Kamperman, USTA Chief Executive, Community Tennis. "The tour will introduce our 10 and Under Tennis program which is a wonderful approach to ensure children build confidence in their skills while having fun and leading a healthy lifestyle." 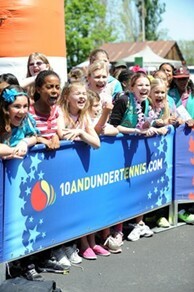 To find more information about the SmashZone mobile tour and to find if it is coming to a city near your check out www.10andundertennis.com.